Provenance Architecturals reclaims portions of a Long Island boardwalk and reprocesses it into flooring for parts of the new Barnes Foundation designed by Tod Williams Billie Tsien Architects. 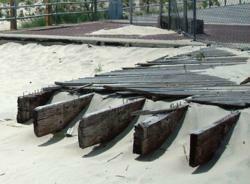 The ipe boardwalk, located on Long Island, prior to reclamation by Provenance Architecturals. Tod and Billie are really happy with the floor. When the Barnes Foundation opens its doors to their new building on May 19, 2012, Dr. Albert Barnes’ renowned art collection will not be the only thing to find its new home in Philadelphia. Portions of a Long Island boardwalk, carefully salvaged and reprocessed by Provenance Architecturals, garners a second life as flooring in the highly anticipated building designed by Tod Williams Billie Tsien Architects. The Barnes Foundation’s Philadelphia campus is aiming for LEED platinum certification; the highest level available by U.S Green Building Council. With this in mind, Tod Williams Billie Tsien Architects, who places an emphasis on environmentally-sound building practices, set about pinpointing a responsibly-harvested source for their wood flooring needs. The search led them to Provenance Architecturals, a Philadelphia-based architectural salvage company who specializes in the identification, reclamation, and reprocessing of reclaimed building elements throughout the East Coast region. The company strives to save historically significant and high quality materials with an emphasis on matching these materials to the needs of current building projects. When the Barnes Foundation project was getting started, Provenance had recently procured approximately 40,000 board feet of a Long Island ipe boardwalk, previously slated for demolition. Ipe, a hardwood grown in the South American rainforest regions, is known for its superior durability and rich color profile; two characteristics that Williams and Tsien’s specifications called for. To see step-by-step images and learn more about how the boardwalk became flooring, visit the Barnes Foundation Project on Provenance's website. Provenance’s mission is to be the vital link between what a material once was and what it can become. We have extensive experience in deconstructing architectural materials and unlocking their value by processing them for reuse. Our team provides this knowledge to our clients and supports them in their aim to reuse whether they want to retain the character and history of the material or incorporate them seamlessly into a new and modern space. To learn more about our deconstruction services, reclaimed materials processing, and design/build projects or to visit our 17,000+ square foot retail/design center, please visit http://www.phillyprovenance.com.